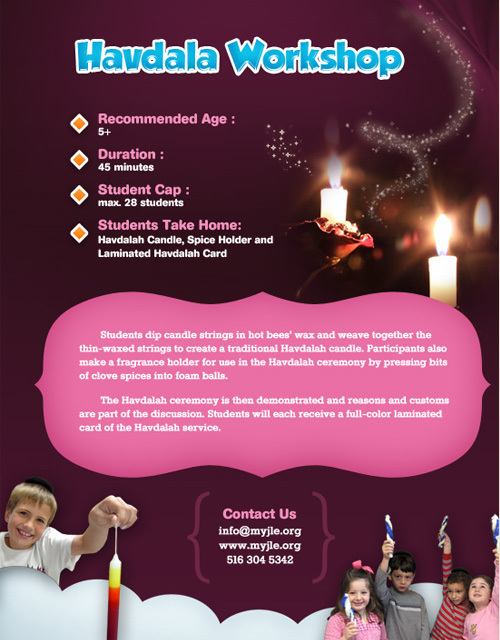 Students dip candle strings in hot bees ’ wax and weave together the thin-waxed strings to create a traditional Havdalah candle. Participants also make a fragrance holder for use in the Havdalah ceremony by pressing bits of clove spices into foam balls. The Havdalah ceremony is then demonstrated and reasons and customs are part of the discussion. Students will each receive a full-color laminated card of the Havdalah service.